In 2017, Nyhart launched Votaire as a solution to the retirement income problem by using a data-driven approach to give guidance that is dynamic, holistic and personalized. Born out of actuarial expertise in the healthcare and pension worlds, Votaire helps defined contribution plan participants develop a decumulation plan and even understand what healthcare might cost them in retirement. Since then, Votaire has expanded to encompass other financial wellness topics, including how to best use an HSA to save for retirement, college savings, emergency funds, and more. But all along, the data-driven actuarial approach has been key. 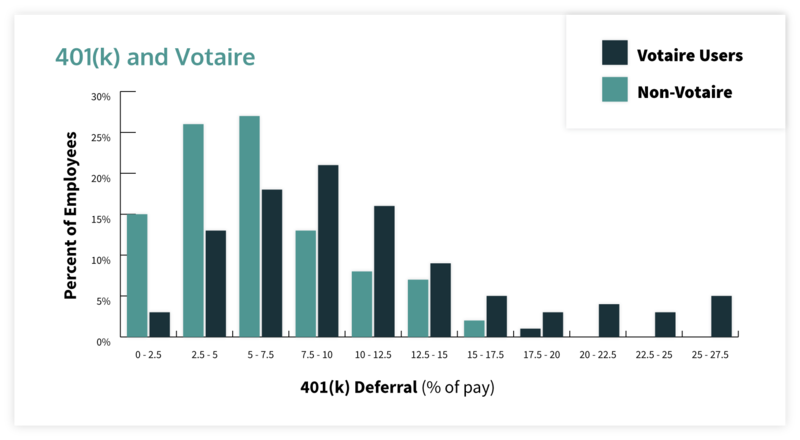 Votaire users contribute 74% more as a percentage of pay to their 401(k) than their coworkers who don’t use Votaire. Votaire users are 70% more likely to increase their HSA contributions than their coworkers who don’t use Votaire. Votaire users are 60% more likely to take additional supplemental life benefits. Additionally, of those that increased the amount of supplemental life coverage elected, the average Votaire user increased their coverage by almost three times as much as those that weren’t using Votaire. To learn more about how Votaire is driving change among participants, contact Sam Weiss at sam.weiss@nyhart.com. * These findings are from actual enrollment data and Nyhart’s 401(k) recordkeeping data.